A short 10 minute walk above the resort takes you to Kalippara Temple, dedicated to Goddess Kali, with 360 degree views from the Agastya mountain range to the lights of Kovalam beach. 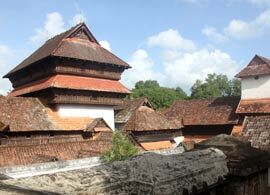 Padmanabha Swami Temple, The landmark Temple and structure of Trivandrum, temple dedicated to Lord Maha Vishnu. Kovalam Beach & Varkala Beach.